Besides anything else "Help" is something we hear a lot. Consequently Tax50 is here to make submitting your Tax Return simple, easy and straightforward. Above all your location is of no concern. Because our dedicated team of experienced professionals at Tax50 will be able to guide you and advise you on any questions or queries you may have regarding the Self Assessment process. Talk to a Tax50 accountant today on 01942 - 538 239. Do not hesitate to contact Tax50 if you have any questions or need any information regarding Self Assessment, Income Tax, Accounts, VAT, Corporation Tax, P.A.Y.E. (Pay As You Earn) or C.I.S. (Construction Industry Scheme). Furthermore, Tax50 has also provided a few useful links for you which should help you answer any questions you may have. Use the contact form below to ask us any questions you may have. What should you look for in a good accountant? First of all this should not be a difficult thing to find. But every business is different. Due to this each industry sector has its own virtues and variables. However, there are also many overlapping factors that affect every industry and every business. Likewise you may look for different things from an accountant. Most noteworthy you will inevitably require the same basic core services as everyone else to help you maintain efficiency. There is no need to be registered with any other accountant. Therefore you can very easily engage Tax50 to prepare your accounts. Once your Automated (SA100) is received by HMRC, we will automatically request an Authorisation Code from HMRC so that you can formally register Tax50 as your accountants and take advantage of our great Accounts & Taxation Solutions. Talk to a Tax50 accountant now on 01942 - 538 239. WANT AN ACCOUNTANT TO HELP YOU WITH HMRC? Because not every accountant is the same. This means not every accountant will help you in the same way. Look no further if you need help with HMRC. Tax50 will make sure that you get the best advice. HMRC (Her Majesty's Revenue and Customs), is responsible for the collection of taxes. These taxes come in a variety of forms such as Direct Taxes, Indirect Taxes and Stealth Taxes. Even more likely is that you will be affected by these taxes in a variety of manners. Whether you are an individual or a business you will always need to consider the effect of taxation. Similarly this applies to almost every aspect of your activities. Tax50 will help you with all aspects of taxation including Income Tax, VAT, Corporation Tax, PAYE (Pay As You Earn), C.I.S. (Construction Industry Scheme) and Capital Gains Tax. Give yourself an accountant that has experience in dealing with all aspects of taxation and is capable of explaining your options in a manner that is easy to understand. NEED AN ACCOUNTANT TO HELP YOU WITH YOUR BUSINESS? Finding an accountant that has experience in dealing with your type of business is not easy. As a result of this, Tax50 can provide you with good advice that will help you run your business in an efficient and profitable manner. Also Tax50 can provide you with the right Accounting Solution for you. For the reason that we will help you incorporate all functions such as Payroll, VAT Compliance, Bookkeeping, Accounts production and Tax Efficiency into a simple solution that will be invaluable to you. 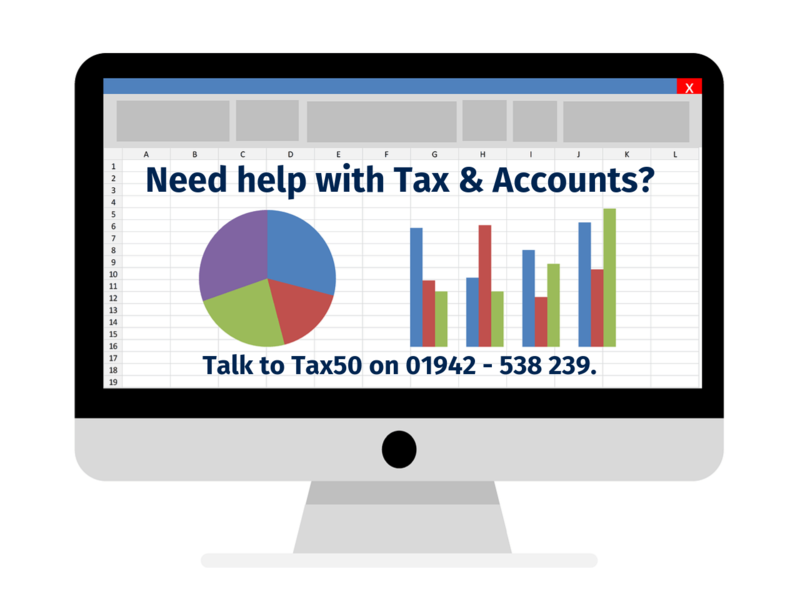 Look no further, let Tax50 help you make managing accounts and taxation straightforward and efficient. A wide range of outsourced accountancy services! In contrast to most, the services provided by Tax50 range from Payroll and VAT compliance, to the management of your entire accounts department. This includes accounting, credit control and administrative support across all of your local, national and international operations. No other accountancy firm in the UK can provide the same service and guarantee as Tax50. When it comes to dealing with VAT, Corporation Tax, and Income Tax, Tax50 are the experts. We offer a Fixed Fee pricing structure and do not charge you extra for Tax and VAT Investigations. Tax50 does not believe you should pay to have our work inspected. You have already paid us to do it right the first time. Outsourcing work to Tax50 is always more cost effective than hiring additional members of staff. Work carried out by an indemnified professional. All work is guaranteed to be accurate. Tax50 provides you with all required stationary. Outsourcing provides a shield against HMRC. Be fully compliant with RTI! It goes without saying that cash flow should be closely managed. Tax50 can help you control Working Capital to maximise your Cash Flow by providing Monthly Management Accounts. With access to current and accurate financial information you will be able to manage your business more efficiently than having to rely on Year End Accounts. We are also experts in the different Tax and VAT schemes operated by HMRC for businesses within every sector. Tax50 is a revolutionary accountant with a Head Office in Wigan serving individual and corporate clients across the UK. Firstly our revolutionary solution is the Tax50 Automated Tax Return (SA100). You can can submit this to HMRC directly from our website. This revolutionary solution allows you to submit your Tax Return to HMRC even if you are not registered with the Government Gateway. All you need is your personal UTR Number (Unique Tax Reference Number) along with a few other basic pieces of information. This solution is perfect for helping you avoid Late Filing Penalties and for helping you submit last minute Tax Returns with ease and efficiency. It also means you do not need to look for any other accountant.